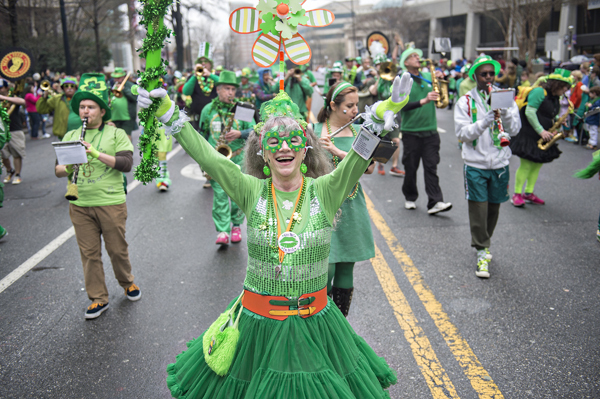 2019 Atlanta St. Pat’s Parade! Saturday, 3/16/2019 St. Patrick’s Day Parade! Muster 2: 12noon. On 16th near Woodruff Art Center by the big flag. We’re marching right in front of the (Irish) flag.–Please go to Muster spot not any other spot you think is better. Step off: about 12:30pm. Parade starts at 12noon, but we’re last, we parade then blitz Caravaca and out to lunch! Costume: All things Irish! Green. Orange. Pregame!! 11am-12:30pm confirmed thanks to Brenda! Post Parade: We usually Blitz Cypress St Pint and Plate, we will mix it up and blitz Caravaca this year since Cypress Street has had its own event and music the last year or two. After parade shennanigans at Patricia’s (address in e-mail) involving no lines, pizza, and a hangout spot by the pool (but not the pool itself). Bring some cash in case you want to go in on the pizza, beverages and ice will be acquired across the street at the QT. Take Marta! Exit @ Arts Center Station.